All three of the materials have a very low viscosity, but not as low as the polyurethane I was printing with before. Due to the low viscosity of the material, a flat printing outline was required. 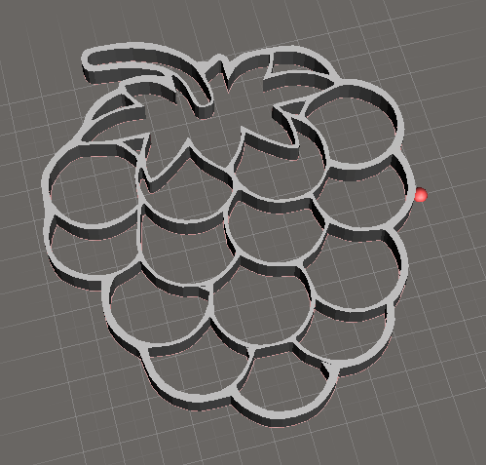 For printing with the honey and the syrup, I chose a flat bee outline, and I went with a berry outline for the liquid pectin since pectin is used to make jellies. Apart from the highly influencing Lotus-like effect described below, the printing performance of these three materials progressed as expected. Similar to my polyurethane printing experience, a continuous extrusion was possible, however, a three-dimensional structure could not be achieved due to the low viscosity and lotus-like effect. The leaves of the lotus flower repel water so strongly that droplets cannot wet the surface and just roll along the surface, taking all dirt with them. We saw a similar effect to this when printing honey onto wax paper. After a line of honey was deposited, it transformed into individual droplets. These droplets grew bigger and attracted adjacent honey. In the end, no visible trace of honey was left in between the drops, as long as the nozzle was not depositing new honey. This behavior could be caused by the surface tension of the liquid. In order to reduce the tension, the surface area was reduced, which should have, ideally, made a sphere shape. This outcome was apparent while I was printing at room temperature. Generally, surface tension decreases with an increasing temperature. For this reason, I heated the building platform to 60 °C and expected to minimize this effect. Instead, the formation of droplets seemed to proceed even faster. In fact, the movement could be observed by the eye. Even though this phenomenon contradicts the general influence of temperature on surface tension, it does not rule out the possibility that this effect is caused by surface tension. The temperature would likely have reduced the surface tension, but it could have also reduced the viscosity. At a lower viscosity, the honey would flow much easier and thus move even faster but still have surface tension. When comparing print two and three, it is obvious that the formed droplets are of a different shape. The droplets of print three visibly wet the surface more because they are slightly more dispersed than the droplets of print two. This supports the idea that the surface tension was in fact lower. This effect appeared almost identical during the prints of the syrup and the pectin. In contrast to the other three materials, the viscosity of cream cheese is significantly higher. For this reason, I expected to achieve an actual three-dimensional structure. 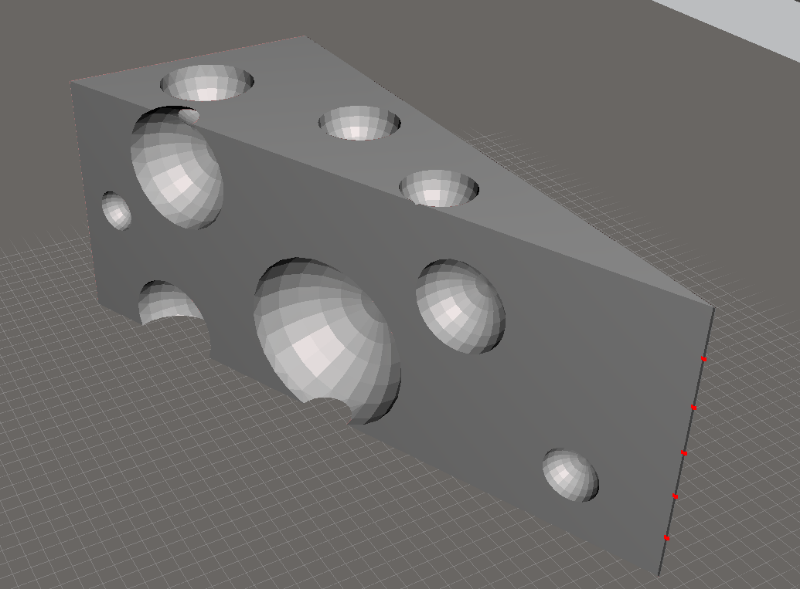 I chose a Swiss cheese block consisting of about ten times as many layers than the prints before. In addition, the internal structure featured cavities that required overhangs to achieve the correct shape. Since cream cheese is more solid than liquid this should have been achievable. I didn't realize the bottom of the design did not consist of an uninterrupted line. Instead, it featured multiple spots at which material was deposited. In the beginning, the performance seemed promising. Each spot featured a z-axis height which was achieved, and none of the resulting cylinder-like structures fell over. Moreover, in between those spots, no material was deposited due to the high viscosity. The prints of cream cheese progressed differently from the first batch of tests. Due to its much higher viscosity, a three-dimensional structure seemed achievable. For this reason, I chose a printing outline that featured about ten-times more layers than the prints before. In addition, the cross section of this print outline was characterized by irregularities that resulted in a frequently interrupted printing path. As with all previous materials in this experiment, this posed a problem. Either the material´s viscosity was too low, which caused a material deposition in between the printing outline, or the material´s viscosity was too high, which caused the extrusion to cease completely. Cream cheese was the first material that featured a significantly varying viscosity during the print. Immediately after taking the cheese out of the refrigerator, the material was almost solid and had a higher viscosity than silicone paste. However, as the cheese approached room temperature, the viscosity decreased. Over time, the viscosity proved to be optimal as the structure based on the interrupted printing outline could be produced. That said, the print could not be completed because the extrusion ceased. Another consideration factor in this experiment was the change of the material during storage. As you are probably aware, cream cheese reacts with the atmosphere which caused hardening and warping. After one night of storage under the influence of the atmosphere, the print warped resulting in lifted edges and cracks on the surface.